Great story telling and I hope it continues on. I loved this podcast. great information told in a great way. The best and brightest took us to the moon with the computing power of pocket calculators. Now they’re taking us farther—and they’re doing it with the tech we’ve been talking about all season. Open source is taking us to Mars. The Season 2 finale takes us to NASA’s Jet Propulsion Laboratory (JPL). Tom Soderstrom shares how much JPL has gained by embracing open source. Hila Lifshitz-Assaf explains that NASA is solving some of their greatest problems with open software and crowdsourcing. And Dan Wachspress describes how working with NASA means proprietary companies need to make some sacrifices—but they get to work on the most innovative projects in the world. The explorers of the final frontier are choosing to work in the open—and Mars is their destination. What’s next? Developer advocates play important roles in open source communities. We brought a few of them together to explain how and why they do what they do. Sandra Persing (Mozilla), Ricky Robinett (Twilio), and Robyn Bergeron (Red Hat) sit down with Saron to share what they’re working on, how they support their communities, and what they’re looking forward to in 2019. What does serverless really mean? Of course there are still servers—the basics of the internet aren’t changing. But what can developers accomplish when someone else handles the servers? Serverless computing makes it easy for beginners to deploy applications and makes work more efficient for the pros. Andrea Passwater shares how convenient it can be to abstract away (or remove from view) the infrastructure components of development. But as with any convenience, going serverless has tradeoffs. Rodric Rabbah explains that going serverless can mean giving up control of your deployment and restricts your ability to respond to problems—which is why he helped create Apache OpenWhisk, an open source serverless environment framework. And Himanshu Pant considers when to use serverless services. Serverless computing should be about developer empowerment. But we have to stay curious about the big picture—even as we simplify our toolbox. Big data is going to help solve big problems: how we grow food; how we deliver supplies to those in need; how we cure disease. But first, we need to figure out how to handle it. Modern life is filled with connected gadgets. We now produce more data in a day than we did over thousands of years. Kenneth Cukier explains how data has changed, and how it’s beginning to change us. Dr. Ellen Grant tells us how Boston Children’s Hospital is using open source software to transform mountains of data into individualized treatments. And Sage Weil shares how Ceph’s scalable and resilient cloud storage helps us manage the data flood. Gathering information is key to understanding the world around us. Big data is helping us expand our never-ending mission of discovery. Failure is the heartbeat of discovery. We stumble a lot trying new things. The trick is to give up on failing fast. Instead, fail better. This episode looks at how tech embraces failure. Approaching failure with curiosity and openness is part of our process. Jennifer Petoff shares how Google has built a culture of learning and improvement from failure. With a shift in perspective, Jessica Rudder shows how embracing mistakes can lead to unexpected successes. And Jen Krieger explains how agile frameworks help us plan for failure. Failure doesn’t have to be the end. It can be a step to something greater. 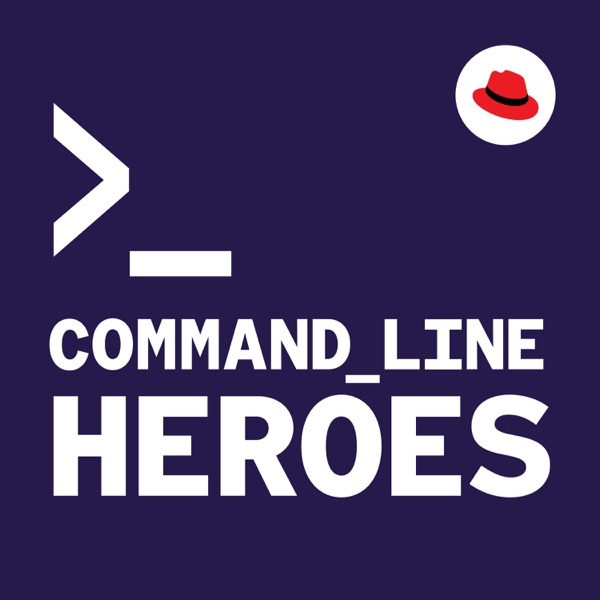 In Season 2 of Command Line Heroes, we’re living on the command line, tracking the changes that shape the world of open source development. We’re discovering the origins of programming languages; mastering the art of making a pull request; learning about supercomputers, hybrid clouds, and more. Where does that lead us? Great heights and beyond. Episode 1 launches September 11th. Listen for free on Apple Podcasts, Google Podcasts, or wherever you do your thing. Imagine a world where open source never caught on, where no one thought it’d be a good idea to make source code available to anyone. In this episode, we imagine this bizarre possibility. And we celebrate the open source tools and methodologies that got us where we are today. Join us as we wrap up Season 1, an almost 30,000-foot view of how the open source world came to be. Next season, we’re zooming in and focusing on the epic struggles of today’s command line heroes. “There is no cloud. It's just someone else's computer.” Or server, to be exact. Big cloud providers offer a relatively easy way to scale out workloads. But what’s the real cost? In this episode, we talk about the battle in the clouds, where any winner is still very much up in the air. Major Hayden, Microsoft’s Bridget Kromhout, and others help us understand the storm that’s brewing and where that leaves open source developers. The rise of Container technologies opens a new frontier for developers, simplifying the movement of work from machine to machine. As Containers become more popular, though, a new battle emerges. This race is for the control of orchestration and involves the industry’s fastest, strongest players. Containers are one of the most important evolutions in the open-source movement and in this episode, featured guests Kelsey Hightower, Google developer advocate, and Laura Frank, Docker Captain and Director of Engineering at Code Ship, along with others, explain how this new technology is the building blocks of the future. As the race to deliver applications ramps up, the wall between development and operations comes crashing down. When it does, those on both sides learn to work together like never before. But what is DevOps, really? Developer guests, including Microsoft’s Scott Hanselman and Cindy Sridharan (better known as @copyconstruct) think about DevOps as a practice from their side of the wall, while members from various operations teams explain what they’ve been working to defend. Differences remain but with DevOps, teams are working better than ever. And this episode explores why that matters for the command line heroes of tomorrow. It's the turn of the 21st century. Open source software is changing the tech landscape. But new patterns of work have now become necessary. Developers search for a revolutionary approach that will allow open source development to flourish. A group of developers convenes at a ski resort in Utah to craft such an approach. What emerges is a manifesto that changes everything. Dave Thomas, one of the authors of the Manifesto for Agile Software Development, brings us back to that now famous retreat where the agile revolution was first organized. Not everyone was as quick to sign on to this new approach, though, and in this episode, we hear why. It's the 1990s. The empire of Microsoft controls 90% of users. Complete standardization of operating systems seems assured. But an unlikely hero arises from amongst the band of open source rebels. Linus Torvalds—meek, bespectacled—releases his Linux O.S. free of charge. While Microsoft reels and regroups, the battleground shifts from personal computers to the Internet. Acclaimed tech journalist Steven Vaughan-Nichols is joined by a team of veterans who relive the tech revolution that reimagined our future. The O.S. Wars. The 1980s is a period of mounting tensions. The empires of Bill Gates and Steve Jobs careen toward an inevitable battle over proprietary software—only one empire can emerge as the purveyor of a standard operating system for millions of users. Gates has formed a powerful alliance with IBM while Jobs tries to maintain the purity of his brand. Their struggle for dominance threatens to engulf the galaxy. Meanwhile, in distant lands, and unbeknownst to the Emperors, open source rebels have begun to gather… Veterans from computer history, including Andy Hertzfeld, from the original Macintosh team, and acclaimed tech journalist Steven Levy, recount the moments of genius, and tragic flaws, that shaped our technology for decades to come.